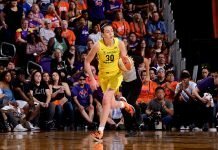 Home WNBA WNBA: here we go again? The WNBA draft is tonight, but it has been hard to tell. Last year there was so much fanfare: videos upon videos of draftee arrivals and adventures in New York City, as well as draft night preparation. Yesterday the WNBA released the names of the 12 athletes invited to the draft, and posted 30-second “rapid-fire” video interviews from five of them on their Twitter feed. That was it. The draft was moved up one week this year, so maybe league officials were in a hurry to get ready, and didn’t have time for the fun stuff. They had also been busy on Monday when they revealed that the league is being rebranded with a new logo, and that there will be a push toward the 18-34 age group in marketing. But that shouldn’t have stopped them from pumping up the draft more. The full rebrand -including putting the logo on uniforms, balls and courts – won’t be rolled out until 2020. So that couldn’t have been what was taking their time from promotion of such a huge night. Maybe it was their search for a league president, which has gone past six months now. Former president Lisa Borders, who resigned in October, has already left the job that she left the WNBA for, and still, no new leader for the best professional women’s basketball league in the world. I officially asked the WNBA two questions this week: When did they think they’d hire a new president? Who will hand out the jerseys to drafted players when their names are called? A spokesperson for the league sent me a link to an Associated Press story from two weeks ago that included an interview with interim president Mark Tatum on all the qualities they are looking for in a new president. “I think that’ll lend some insight,” the spokesperson said. I guess we will see when the draft begins. Hopefully whomever it is will be able to take great photos with the draftees. Here we go again, I guess. The WNBA’s 23rd season. Hope they (soon) find a president who can successfully negotiate the CBA, so there can be a 24th season.